Facilities have always been focused on a positive reflection to their company’s bottom line, however, as a number of organizations continue to concentrate on metrics, others have begun to focus toward more personalized, customizable settings, and the ability for organization to innovate, while aiming to drive lucrative results. Facilities are seeing the advantages of adopting new, alternative ways of working, while changing different business elements, including; design, processes, equipment, strategy, etc. The look and function of many improved facility design trends can be linked to new technology, materials, and improved product design. Utilizing various individuals; such as architects, building managers, and consumers/patrons, ensures the preparation and groundwork. Newly designed facilities have begun to procure smart technologies in commercial washrooms, providing health and safety improvements, environmental benefits, and a cut in overall costs. Upon inspection of building materials, manufacturers and managers are recognizing just how facility structures and equipment can harbor bacteria and spread infection. Up until recently, countertops, sinks, and other solid-surface areas were not studied or testing for infection control. Although properties may not always be visible, porous counter top materials, such as granite, marble, or natural stone, are optimal sites for cross-contamination to occur. Solid surface goods have been gaining popularity in healthcare facilities for their infection control properties, ability to reduce nosocomial infection rates, and the simple steps required for cleaning and sterilization. Solid surface products are repairable on-site and act as a protection product, safeguarding surfaces receiving repeated impacts, and increasing the ease of maintainability. Initial costs can seem arduous, however, the lifecycle of solid surface products outweighs the higher, upfront expense. The past decade has seen increased efforts to cut down the transfer of germs and bacteria, while reducing waste. Automated device dispensing technologies have grown to be one of the most prominent features in commercial washroom design, and the continued preference among customers and business owners. Touch-free systems are convenient; easy to activate, clean and maintain, while reducing the impact of cross-contamination across the facility. 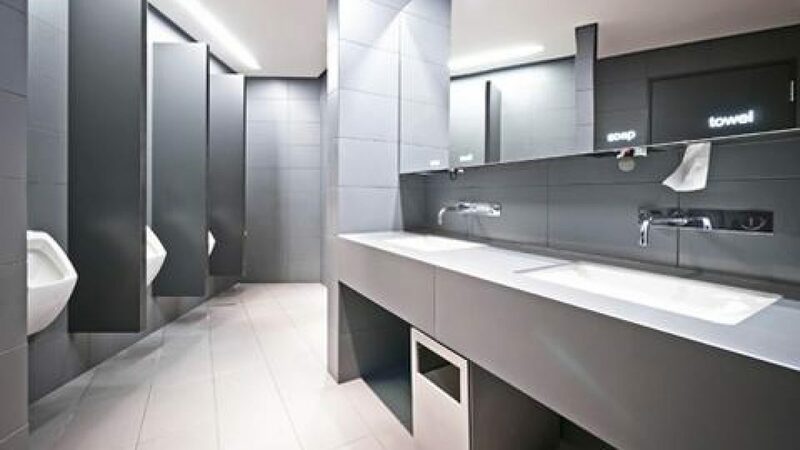 Similar to solid surface products, touchless systems involve an increased initial cost in comparison to traditional commercial washroom fixtures. Building managers have expressed concern that if money is being spend on an upfront investment, touch-free systems should provide additional benefits to the facility. Hand-free fixtures offer a variety of advantages, which include; reducing water use by nearly 25%, lowering facility costs, and assisting individuals with disabilities –who may have a difficult time operating conventional commercial washroom systems. To invest is to allocate money and/or resources, in the expectation of some benefit in the future. Investing the necessary capital to improve the commercial washrooms within your facility will generate a more economical system, while creating a clean, hygienic, and pleasant experience for patrons. Choosing the right material and fixtures in a facility is extremely important. Arranging the extra spend on long-lasting systems and equipment can prevent costly maintenance repairs and upgrades for years to come. Recent years have shown a change in sustainability of building management. Elegant design and sustainable design are no longer mutually exclusive -what once was a choice, is a now a responsibility. 58% of building and facility managers state that commercial washrooms are their starting point when concentration on water conservation efforts. Manufacturers have taken note of this trend, making progress in advanced sourcing, engineering, and production technologies. High-speed hand dryers eliminate paper waste, while promoting hygienic benefits, reducing costs, and cutting down on extra maintenance effort and cost. When compared to traditional systems, new, highly energy-efficient hand dryer models use approximately 80% less electricity, while drying hands in 10 seconds. Facilities equipped with foam soap dispensers use 36% less product, and estimate as much as 46% in water savings. Universal improvements in commercial washroom design offers valuable solutions to managers, employees, patrons, and consumers. Improvements to facility systems allows for refined workflow planning, that improves experience and reduces the likelihood for spread of germs and bacteria.